The Church of St Peter stands in the centre of the village and has been part of our history since the middle ages. Services are held every Sunday and on special occasions. St Peters School regularly uses the Church, and the Ilton Village Carol Services fills the church every year. 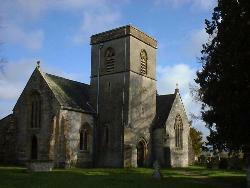 There has been a church on the present site in Ilton since about 800 AD. Records from that time are insubstantial until a proper church register commences in 1642. The current building is early 14th century and is officially described as "an edifice of stone in the Early Decorated and Perpendicular style." By 1882 the Tower and its lead-case wooden spire with a clock was in a very dilapidated state and was dangerously leaning over a yard out of the perpendicular. Appeals to the Wyndham Estate, the largest employers in the village, and the Ecclesiastical Commissioners were met with only sympathy. It was the parishioners who funded the strengthening of the foundations, and the top part of the tower was rebuilt with brick in its present square shape. St Peter's is one of only four churches in England to retain the medieval tradition of using "housling cloths" at the celebration of Holy Communion. The others are Westminster Abbey, Wimborne Minster, and Hexham Abbey. The word "housel" is Anglo Saxon, is used in the canons of King Edgar (960 AD) and by Spenser and Chaucer to mean "offering" or "obligation." The cloths were used to catch the crumbs of the blest bread when it was broken. We use them to shroud the sanctuary rails. The brass effigy at the entrance to the choir vestry was erected to the memory of Nicolas Wadham who died in Merrifield House in December 1508. There are other fascinating brasses and effigies of the Wadham family in the church. The stained glass window in the south chancel was given by the parishioners to commemorate the major restoration of the church in 1860. A window on the south side of the nave is unique - it is of clear glass, beautifully engraved by Lawrence Whistler in memory of Henry Cecil Graham who died in 1957. It was commissioned by his wife who lived in the village until her death in 1984. Her relatives commissioned another window by Whistler in her memory. It is a pretty yet petit passion flower in the south transept window. The church has to be locked for security reasons, but if you want to enter to pray, to have some quiet time, or just to view, then please contact a Church Warden who will be happy to help. They are also willing to give guided tours of the church - by arrangement. Every week, prayers are said for those who live in the village. Over 200 village children have been baptised in the church since 1968 and each event has normally been the occasion to commence happy family parties.